Posted Sep 04, 2018 by Eds. The last thing we need is to introduce all of the world’s political conflicts into climate change policy, writes Dr. Paul Oquist, Nicaragua’s chief climate negotiator. The political attack piece ‘Nicaraguan Actions Cast a Shadow over its Leadership of Major Climate Change Group‘ in the Policy and Ethical Section of Scientific American is not scientific and it is not ethical. It is not even decent journalism. Based largely on anonymous sources and unfounded accusations, it supports the coup d’état position that recently failed to produce a violent overthrow of the government of President Daniel Ortega. 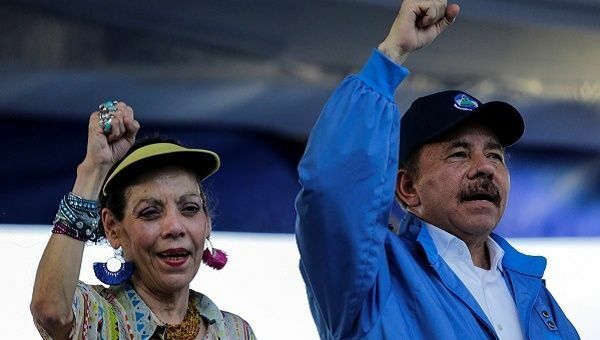 Ortega was overwhelmingly re-elected in 2016 with 72 percent of the vote, a figure congruent with all of the polls, opposition and government, foreign and national. Because the internal coup attempt failed, an international campaign to discredit the government has accelerated. Unfortunately, the David Ackerman article lowers Scientific American from ‘prestigious science journal’ to ‘cheap propaganda rag’ by adding to this campaign. The article states that some of the sources on forestry issues demand anonymity “for fear of their safety” to give the impression of lack of freedom of expression. Others in the very same article speak freely without such histrionics. The Humboldt Center has criticized government environmental policy for years. It is hard to find a more open society in terms of freedom of expression. There are television channels that call for the violent overthrow of the government, slander and threaten the president daily without consequence. Could that occur in the United States or in Britain? The point is that the article goes out of its way to create a coup-friendly, distorted view of Nicaragua. The author marvels that there could be a movement over a forest fire in a remote area that soon became a movement against social security reform that continued even after the rescinding of the reform. He finds it difficult to conclude that these were pretexts, even though they were followed by looting, the burning of public buildings and vehicles, road blocks on highways and streets to disrupt the economy and create scarcity, attacks on police stations, 22 policemen killed, 198 Sandinistas killed, kidnappings of Sandinistas seen in videos of the terrorists, naked and tortured, burning of human beings, atrocities, all of which was part of the terrorist campaign to provoke the violent overthrow of the constitutional government. The author cannot see this and sticks to the fairy tale of only peaceful demonstrators and repression. The article is totally biased and unbalanced. The article claims Nicaragua has not protected its forests and especially Indian lands. It discovers in 2018 that Nicaragua–like Brazil, Peru, and Colombia–has a centuries-long agricultural frontier that poses one of its greatest environmental problems. It ignores absolutely and completely the major actions that the government has undertaken to combat this phenomenon of deforestation and land degradation. The government in the 1980s created the Autonomous Region of the North Caribbean and the Autonomous Region of the South Caribbean to devolve rights over natural resources, health and education to local residents with special protections for Indigenous and Afro-Caribbean rights. The traditional lands have been delimited and titled. A total of 23 Indian and Afro-Descendent territories composed of 304 communities has received title to 38,233.16 square kilometers of inalienable land in perpetuity. This community’s rights are represented by territorial governments that can sign leasing agreements for economic activities benefiting their population. To put the magnitude of this in perspective, the sister Republic of El Salvador has 21,000 square kilometers and the Kingdom of Belgium 41,000. The Army of Nicaragua has created an Ecological Brigade of 300 soldiers to protect the reserve and biosphere territories. It has undertaken armed operations against illegal logger mafias that try to exploit the high value of the tropical hardwoods involved: Rosewood, Granadillo, Mahagony, among many others. Through widespread community forestry participation, forest fires have been reduced by 93 percent since 2007, being highly significant peer pressure in reducing slash-and-burn agriculture. The government, as part of the 20×20 Initiative, is reforesting using a landscape approach 1.2 million hectares of land degraded over the decades by the agricultural frontier. In the final stage of formulating with the World Bank is an ENDE-REDD Plan for the Caribbean Coast that combines community forestry, especially in the Indian communities; agroforestry and silvopastoral solutions, as well as plantations of Teak that do extraordinarily well in the region. The strategy for settling the colonists is farms that have valuable trees, robusta coffee and cacao: valuable assets they won’t abandon. Nicaragua has qualified for the methodologically challenging Forest Carbon Partnership and has committed to sequester 11 million metric tons of greenhouse gases that will activate U.S. $55 million in incentives for the Indian communities, farmers and foresters who participate in the ENDE-REDD plan for reforestation based on results. Not a single one of these Caribbean Coast policy elements is mentioned in the one-sided attack piece. The same modus operandi is applied to international climate change policy. It criticizes Nicaragua’s original position on the Paris Accord, which was a valiant speaking of truth to power. The Paris Accord INDCs do not add up to a 1.5° or even 2°C average world temperature rise in this century. Nicaragua argued that more ambition was required, especially from the large emitter who can make a difference. With the exception of the climate change deniers, that position is now one of consensus. Who maintains now that there is not a need for greater ambition to achieve the Paris Accord goals? That is why Nicaragua signed: to fight with the other developing countries for more ambition from the large emitters. The author, however, prefers to follow the fake news of Climate Home and attribute, based on nothing, motivations to the government by positing a desire to achieve the Co-Presidency of the Green Climate Fund. Nicaragua has served on the Transition Committee of the GCF, negotiated the final agreement at COP-17 in Durban, the Standing Committee on Finance of the Convention, and the Interim Directorate of the Warsaw Loss and Damages Mechanism. It has always been active in climate change issues because President Daniel Ortega and Vice-President Rosario Murillo consider climate change to be one of the principal challenges to Nicaraguan development and, together with weapons of mass destruction, one of the major threats to humankind and life on Earth. The article questions Nicaragua’s environmental policy credentials, ignoring completely that the country has gone from 25 percent renewable energy in 2007 to 54 percent last year, based on hydroelectric, geothermal, wind, biomass and solar projects, with plans to reach 90 percent by 2020. The electricity coverage of households has gone from 54 percent in 2007 to 94.9 percent in July, 2018. This in the second-poorest country in Latin America and the Caribbean that has had the third-fastest growth rate in the region (4.8 percent annual in the past seven years) and has reduced extreme poverty from 17 percent in 2007 to six percent in 2016. The unfounded smear job on Nicaragua, its environmental policies and international climate change positions is used to attempt to politicize the Green Climate Fund, questioning a Co-Chair on political grounds. The last thing we need is to introduce all of the world’s political conflicts into climate change policy. Climate change is the one area where all of humanity has common interests around which we should all unite. Scientific American would do better by sticking to science. Dr. Paul Oquist is Nicaragua’s chief climate negotiator.